About us - Two Rivers Cider Co.
We were recently featured in "Inside Land Park"
and previously in Sacramento News & Review! History of Two Rivers Cider Co.
Back when founder Vince Sterne started Two Rivers Cider Company there weren’t any micro ciders on the market. Cider not only seemed like a fun way to get into the fermentation industry but because it doesn’t require a brew house, it was a much easier set-up. The learning curve was steep because making cider is more like making wine than brewing beer. It took a fair amount of cider tasting as well as traveling to Europe where cider had more of a following before Sterne got the science of it down. One of the things that make Two Rivers unique is that they didn’t merely find a cider that people liked and then stop there; the cider makers at Two Rivers are constantly trying to make better cider and experiment with new flavors so that long-time customers have new things to try and new tasters have many exciting options. The ciders at Two Rivers do not have sugar added in to sweeten them up – they are made so that the fruits are the focus. Other fruits are blended with the apples to create distinct flavors and variety: the Huckleberry cider is sweeter and more floral, the ever-popular Pomegranate is more tart in profile, and there is even a Triple Hopped Cider for those who prefer hop-heavy beverages. ​After being in business 20 years, Sterne and his crew decided that the popularity and awareness of cider had risen enough that a cider pub could thrive. In July of 2016 Two Rivers opened their tasting room on the same premises where they make all their cider. In less than a year it has become a neighborhood spot with regulars who enjoy the company, the atmosphere, and the cider. Please see the Events page for information on music, food trucks, and community involvement. Cider has deep roots in American history. In colonial times, hard cider was by far the most popular alcoholic beverage, far more than whiskey, wine, or beer. Apple orchards were planted throughout the eastern states, not for eating but for making cider. Unlike other alcoholic beverages, apple cider can be consumed at any time of day. In fact, John Adams, 2nd president of the United States, drank it regularly at breakfast to “soothe his stomach”. Even today, one can find Vincent Sterne with a pint of cider along side his eggs and bagel. Hard apple cider continued in it's popularity well into the 1800s due in part to the legendary efforts of Johnny Appleseed. He planted many apple trees in the mid-west and spread the art of cider making to that area of the country. 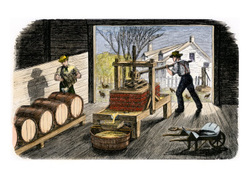 Perhaps the height of ciders popularity came in the election of 1840 when the conservative Whig candidate William Harrison managed to convince a majority of working class Americans that he was one of them by associating himself with the symbols of “log cabin and hard cider".Many factors contributed to the demise of cider making. Settlers' expansion to the arid western states, German immigrants setting up large, sophisticated breweries for beer. And we all remember the Prohibition Law which marked the death bell for cider. Cider making virtually became a lost art in America. But thanks to the growing popularity of microbreweries in the 1990s, Hard Apple Cider is once again enjoying a resurgence in popularity. Just as the micro brewing revolution stirred interest in many nearly forgotten styles of beer and ale, artisan cider makers have brought forth a new found appreciation of the apple. Two Rivers Hard Cider Company has proudly brought back a true micro-cidery approach to making cider. Forget Diamond White 'cider' concoctions. You can practically taste the orchard in a bottle of real cider. Small farms like Sheppy's have been making real cider in Somerset for almost two hundred years. This short film follows their farm through the year's work of pruning, growing, harvesting, fermenting and bottling. The narration is by James Crowden who has been described, quite rightly, as the 'Poet Laureate of Cider'.